South-Eastern Ontario Beset by April Tornadoes — No April Fool’s! 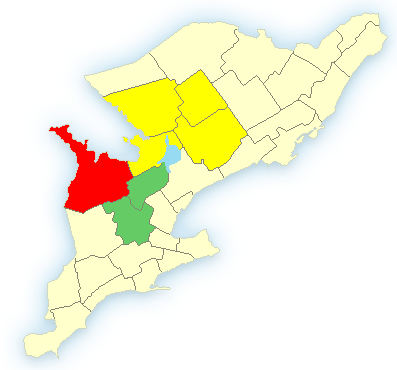 The region coloured in bright red in the map of southern Ontario above denotes a region called “Barrie-Orillia-Midland”; and is so coloured to indicate a weather warning. (Amber indicates a weather watch, while green indicates watch/warning ended.) Source: Environment Canada, 11-Apr-2011. So far, no reports of twisters reaching the ground or causing damage/fatality have been reported. Should such events follow this extraordinary event, I’ll be sure to post updates to this article for reference.